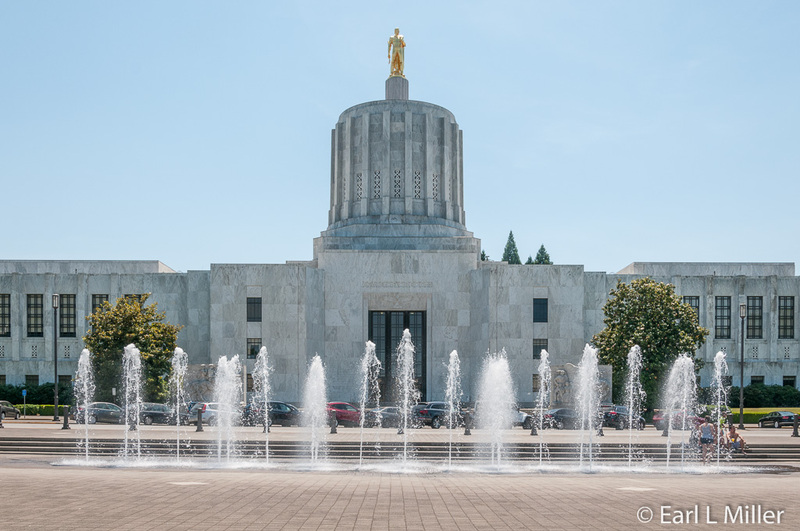 Salem, located 47 miles south of Portland, is well known for being the capitol of Oregon. It’s quiet and laid back, much more like a college town than one steeped in government. Maybe that’s because Willamette University, established in 1842 as the first university in the western U.S., is across the street from the capitol building. It’s a historic town which was a mission in 1841. You can explore that history at the Willamette Heritage Center as well as tour the Thomas Kay Woolen Mill, which operated from 1889 to 1962. For those who enjoy art galleries, the Hallie Ford Museum and Bush House Museum attract visitors. You can also visit a small forestry center in a building constructed by the CCC and learn about the mental health hospital connected with One Flew Over the Cuckoo Nest. The Willamette Queen provides excursion and meal cruises while the Volcanoes play minor league ball. 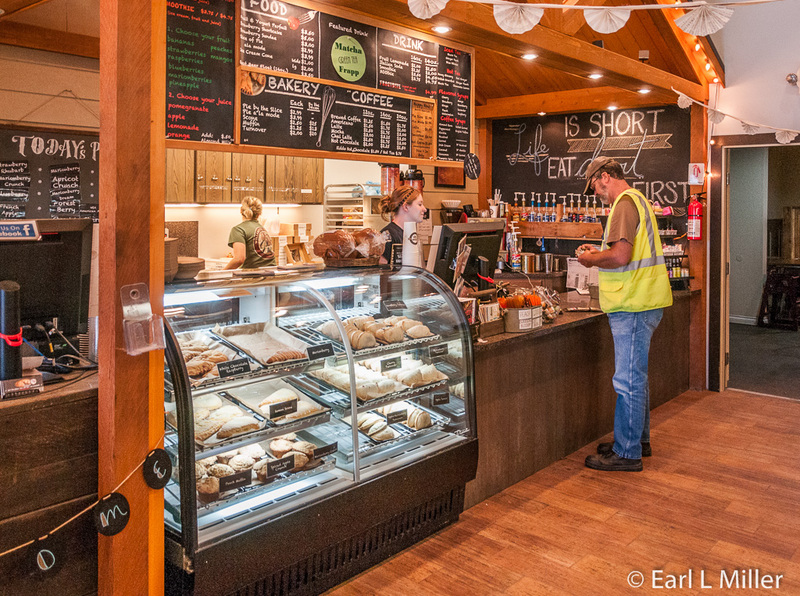 Another option is stopping by Willamette Pie Company to see how they make their delicious pastry. In short, Salem offers several days of exploration for its visitors. 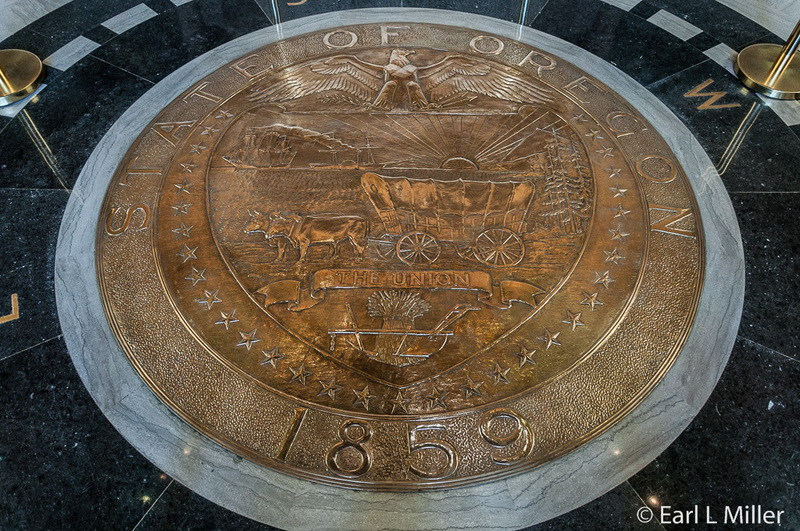 Oregon’s present capitol building is its third. The first was destroyed, eleven days after construction was finished, on December 30, 1855, when a fire swept through the newly occupied statehouse completely destroying the structure. The second, patterned after the U.S. Capitol, served from 1873 until it was destroyed in a fire on April 25, 1935. The current four-story building of Modern Greek architecture was dedicated October 1, 1938. It’s the fourth newest capitol in the United States. Its wings were added and dedicated in 1977. The firm of Francis Keally, from New York City, heavily used marble in the building’s construction. The exterior is faced with white Danby, Vermont marble. Rose Travertine from Montana lines the rotunda, halls, and all lobby areas. The rotunda’s floor and staircases are composed of large squares of Phoenix Napoleon grey marble from Missouri with borders of Radio Black marble from Vermont. Atop the building is “The Gold Pioneer,” a 23-foot tall statue. 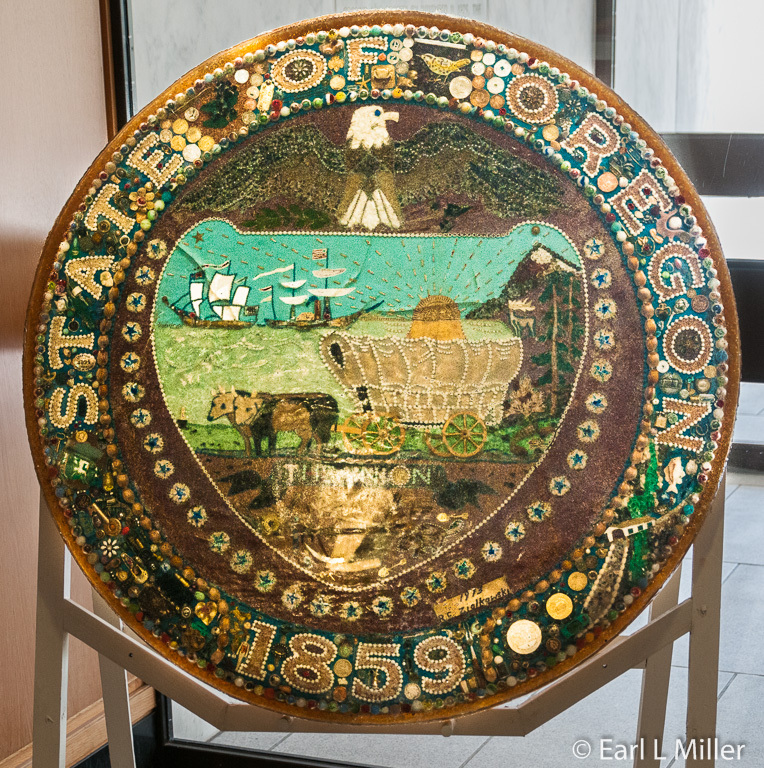 Representing the spirit of Oregon’s early settlers, it is cast in bronze and finished in gold leaf. The base is 140 feet above the ground. Inquire about tower tours that ascend 121 spiraling steps up into the tower from the building’s fourth floor onto a deck. These tours weren’t offered the day we were there but are supposed to provide spectacular views of Salem. The building is the first state capitol to have solar panels. Tours take place Monday through Friday from 10:30 a.m., 11:30 a.m., 1:30 p.m., and 2:30 p.m. Monday through Friday. 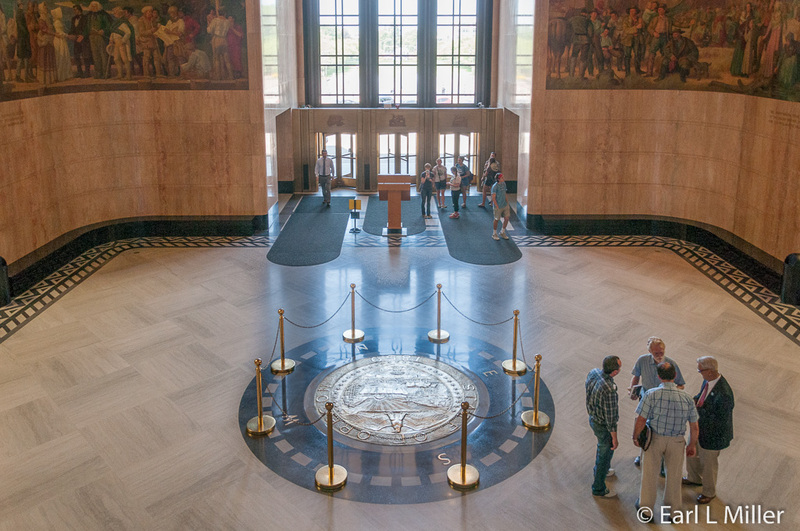 You will have the rotunda paintings pointed out to you, have the bronze state seal explained, and visit the governor’s ceremonial office. 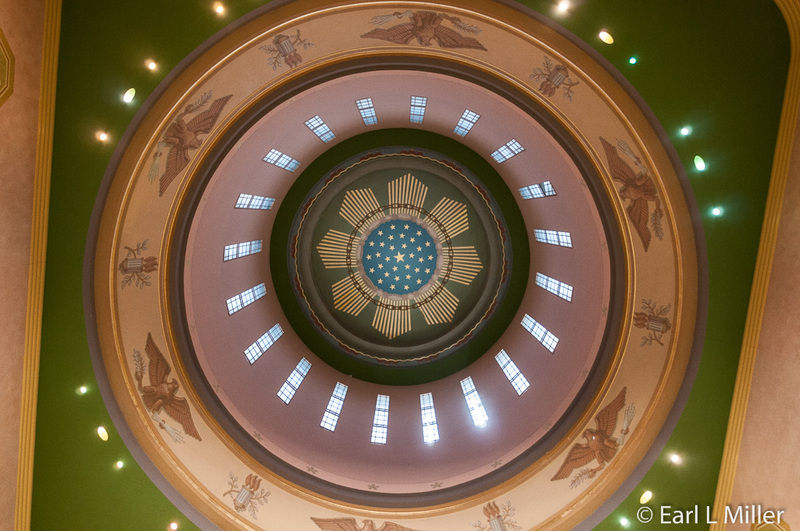 While we were visiting, the legislature was in session on the building’s third floor. We were allowed, without the guide, to enter each chamber to hear the proceedings. The building also houses the offices of the Secretary of State and the State Treasurer. Near the information desk and gift shop is a different kind of state seal. It was put together by artist R.E. Ziolkowski in 1973 from 2300 pieces of just plain stuff. It’s called a sewer seal. You’ll see four large murals surrounding the rotunda. These illustrate events in Oregon’s history. Captain Robert Gray stands at the mouth of the Columbia River which was named after his ship. 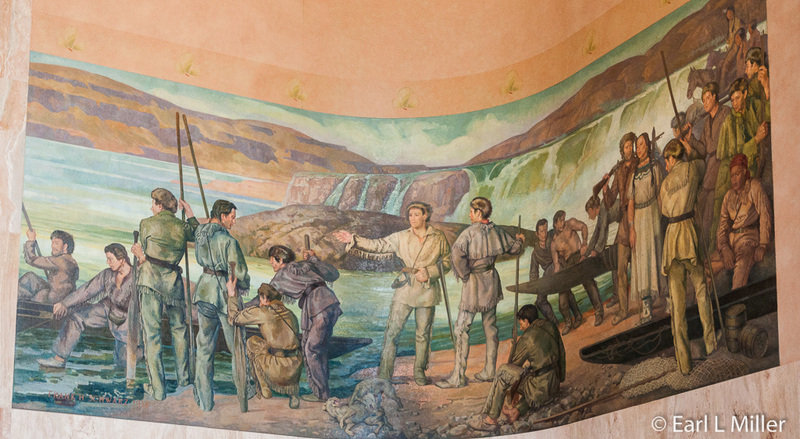 Next is one of Lewis and Clark at Celilo Falls near the Dalles in 1805. They are accompanied by Sacajawea, the only woman on the journey, and York, the first African American to come to the Oregon Territory and own property. He was Clark’s slave and was later freed by Clark. The third is of Narcissa Whitman and Eliza Spalding who established Christianity in Oregon. Dr. John McLoughlin, the “Father of Oregon” is also in this mural. He was Chief Factor of the Hudson Bay Company located at Fort Vancouver. The final one portrays the first wagon train migration in 1843. Nine hundred people, including 600 children, comprised this train of 250 wagons. Governors serve for four year and can be elected to serve two consecutive terms. The governor’s suite is on the second floor. A reception room, public ceremonial office, and private staff office comprise it. You’ll see a map of Oregon above the fireplace in the ceremonial office. You’ll also spot an ornate table in the reception area composed of 40 different types of wood, more than 2,000 pieces, depicting the previous capitol building. In a glass case, you’ll see a small flag which went to the Moon in 1969 on Apollo 11. These two areas are frequently used for art exhibits. Governors can select whether they want a statue or portrait done of themselves. 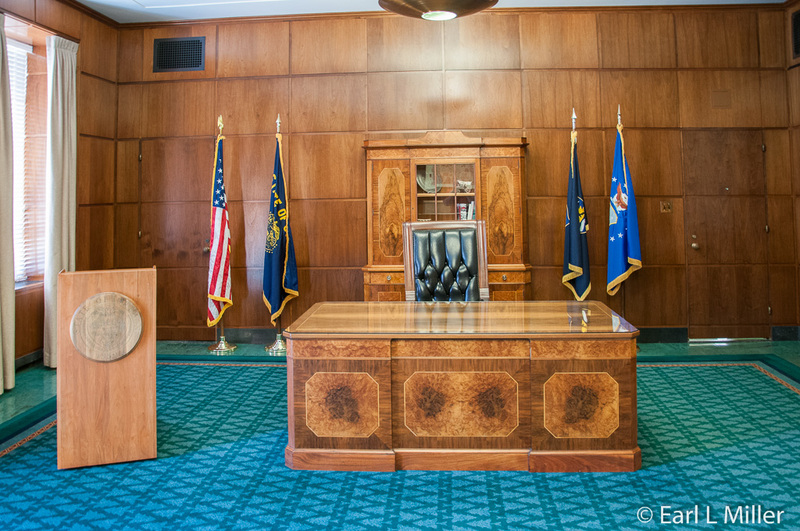 Portraits of governors since 1935 are also in the ceremonial office including one of Barbara Roberts, Oregon’s first woman governor (1991-1995). Kate Brown is the current governor. We also saw a statue of former Governor Tom McCall famous for the Beach Bill which made all of Oregon’s beaches public and the Bottle Bill, a law regarding a nickel refund on cans and bottles. Oregon was the first to have a Bottle Bill. The House of Representatives is comprised of 60 members serving two year terms with no term limits. The paneling and desks in this chamber are of golden oak. The carpet has the pattern of the Douglas fir, the state tree. The mural above the Speaker’s desk shows Champoeg in 1843, where it was voted to establish a provisional government. The 30 senators serve four year terms with no term limits. Their paneling and furniture are of black walnut. Their carpet has the symbols of alternating sheafs of wheat and salmon representing the agriculture and fishing industries. The mural represents Salem citizens receiving news of statehood. The Capitol is located at 900 Court Street N.E. The phone number is (503) 986-1848. 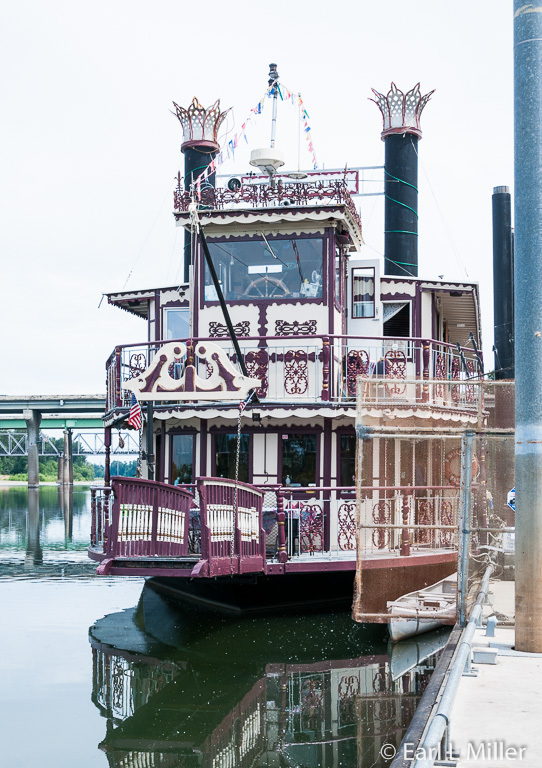 You’ll find the Willamette Queen docked at Salem’s Riverfront Park. She’s an 87-foot, 24 feet wide, 100 tons, twin paddle-wheeler. She has a U.S. Coast Guard capacity of 101 with seating for 80. Built in Newport, Oregon in 1990, she was originally called “The Newport Belle” and designed as a scaled-down likeness of the former Mississippi and Yukon Territory riverboats. Her paddles actually propel her. The boat is a family run operation by Richard and Barbara Chesbrough. Richard has been a USCG 100 ton licensed captain for more than thirty years. He took his family on a 25,000 mile world cruise on his 45-foot yacht “Moon Mist.” In 1978, he competed in the 6,000 mile “Tall Ships Race” and placed fourth aboard his vessel “Lady Frei,” a 102-foot square-rigged brigantine schooner. He has also managed a fleet of sailing and fishing charter boats. 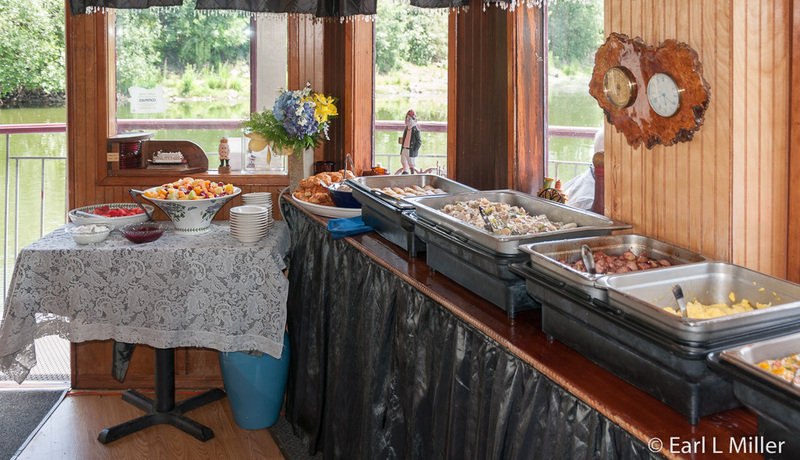 Barbara loves to cook and when there are less than 25 passengers on a trip, she prepares all of the meal whether it’s for the Sunday brunch, lunch, or dinner cruises. Talking to them, even briefly, you capture their enthusiasm and love for what they are doing. Particularly, when Barbara points out the souvenirs related to cruises her past passengers have sent them as gifts. They have run it since 1998. Special events are a big thing for them such as costume parties or mystery dinners. They also handle lots of weddings - sometimes two in one day. Richard is an ordained minister so he conducts the ceremony right before the boat leaves the docks. The dinner reception is held on board with the bride picking the menu from a list. Cruises on holidays, which normally sell out, have entertainers such as a guitarist or singer. 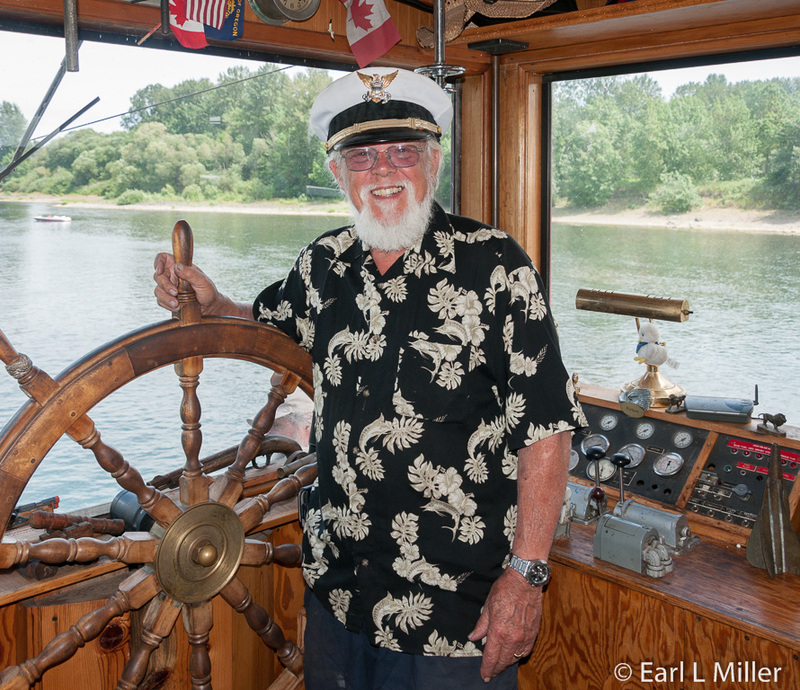 When there are no performers, Richard provides narration about the 187-mile long Willamette River and riverboats. They usually go 1-1/2 miles on each side of Riverfront Park, depending on the water level and river conditions, at a speed of three to four miles per hour. We took the two-hour brunch cruise on Father’s Day. The entertainment was a singer. We didn’t see any special sites to report. Instead, we found it a relaxing trip with superb food. Earl called it “A floating restaurant. A very good one.” I thought it was some of the best food we have had on the entire trip. A buffet was set for most of the meal downstairs when we started. It included such salads as pasta, fruit, spinach, and chicken; kielbasa with fruit; a frittata; blintzes, and potato with Florentine topping. 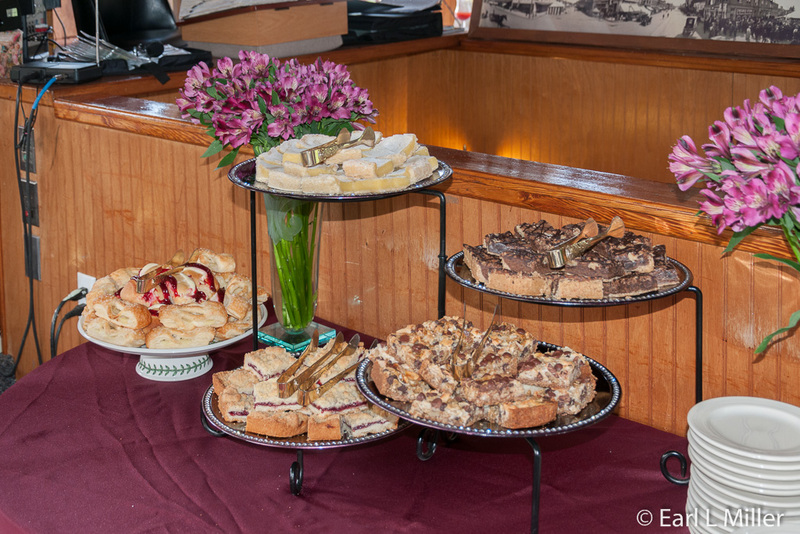 The desert bar started upstairs when the boat turned around with delicious lemon squares and apple turnovers. Youngsters receive a special treat. They are invited to put their hands on the wheel. If they do, they get a certificate saying they have driven the boat. Reservations are required for all cruises. 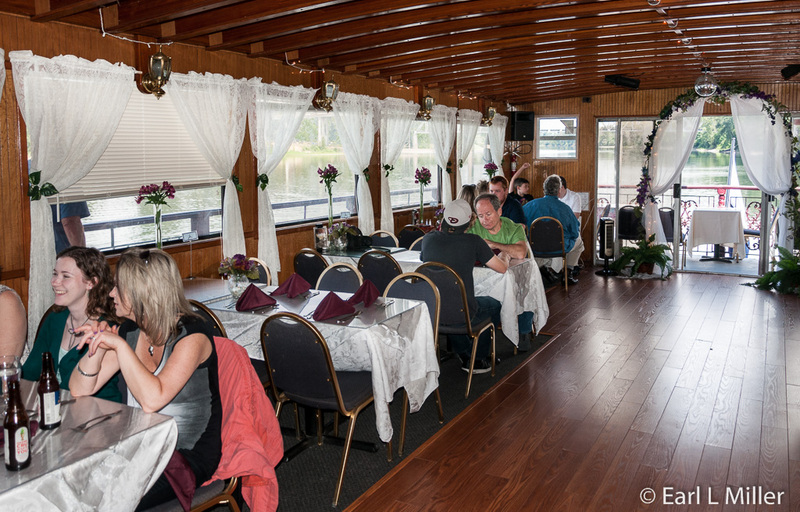 One hour lunch cruises run noon to 1:00 p.m., Monday through Saturday. The charge is $25 for adults and $16 for children ages 4-11. Two hour dinner cruises run every day but Monday and cost $48 and $26 respectively. Two hour Sunday brunch cruises, from noon to 2:00 p.m., are $48 and $28. One hour excursion cruises leave at 2:00 p.m. Monday through Saturday and 3:00 p.m. on Sundays. Cost is $12 for adults and $6 for ages 4-11. Children, ages three and younger, travel for free on all cruises. On each trip, a full bar is available and snacks can be obtained on excursion cruises. A gift shop is downstairs. One thing that Oregon is short of is major league sports teams. However, for those yearning to see minor league baseball, Salem has an option, its level A baseball team in the NW league, the Salem-Keizer Volcanoes. The stadium holds 4,254 fans with lots of seats available. Tickets costs between $12 and $20. We chose the $14 tickets down the first base line and found they had seat backs and good views of the field. On July 15, we went to see the Salem Volcanoes play Boise. I was getting tired and cold by the end of the 9th inning and didn’t want the game to go into overtime. The score was tied 4 to 4. I turned to Earl and said,” Now would be a great time for a walk-off home run. The lead-off batter came up and on his second pitch deposited the ball on the other side of the stadium fence. You could say the Volcanes erupted beating Boise 5-4. I was disappointed that no special events took place between innings, and that the stadium scoreboard couldn’t keep up-to-date with the balls and strikes. The park does offer promotions. Hot dogs, popcorn, and sodas were all offered for $1 the night we attended.The stadium has eleven concession stands. 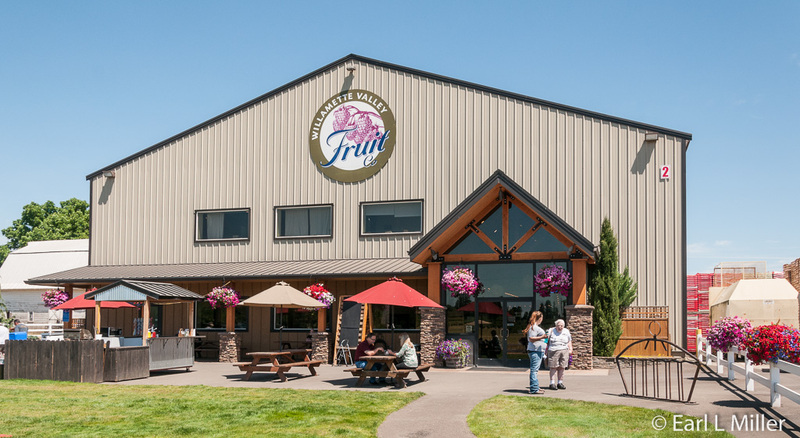 This company is billed in the guidebooks as Willamette Valley Fruit Company. This was correct two years ago when the firm was one entity. I was disappointed when I arrived in north Salem looking forward to a tour of how they process and distribute their large variety of fruit. I was told they no longer do this. Instead, they sell fruit at their company store. Available for purchase are 12 kinds of packaged fruit in two, five, or 30 pound amounts. These range from strawberry, blueberry, and three kinds of raspberry to strawberry, forest berry and marionberry, their most popular. They also carry peach, mango, cherry, apricot, and cranberry. In addition, the store sells quick-frozen fruit. All of the fruit, except for the apples from Washington, come from within fifteen miles of the plant. It’s purchased from local farmers which makes sense since the Willamette Valley is a huge agricultural area. However, now they’re actually two firms in one location working together. The one next door to the fruit distribution plant goes by the name of Willamette Valley Pie Company. You can look through windows inside their store or in front of their building to see how they make 36 varieties. 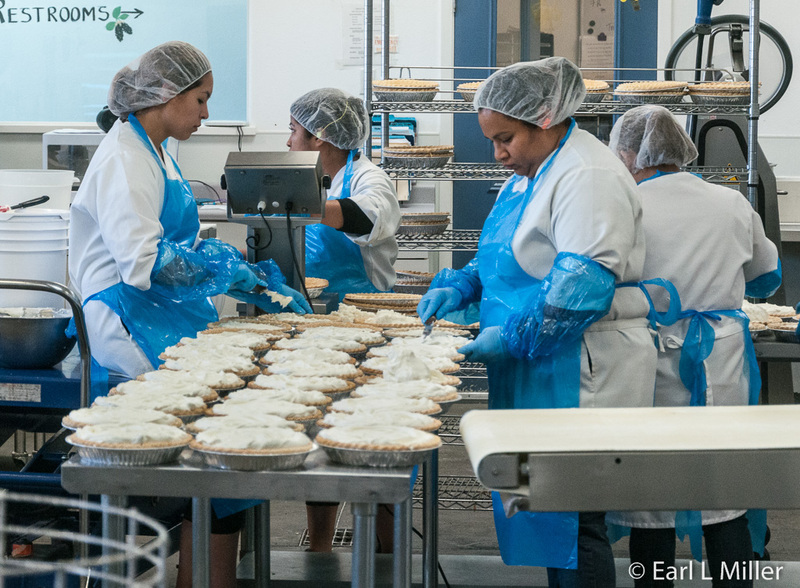 In an eight-hour shift, they make 2600 pies, including all the crimping by hand. If you would like to talk to someone for additional information, call the factory and schedule this in advance. Most of their business is filling large orders. However, they also offer individual pies that are frozen or ready to bake. If you give them 24 hours notice, you can order a pie for a dollar extra and pick it up at the store the next day. They also sell six packs of fruit turnovers and mini pies which they make at their bakery. They have a variety of other items available for purchase. 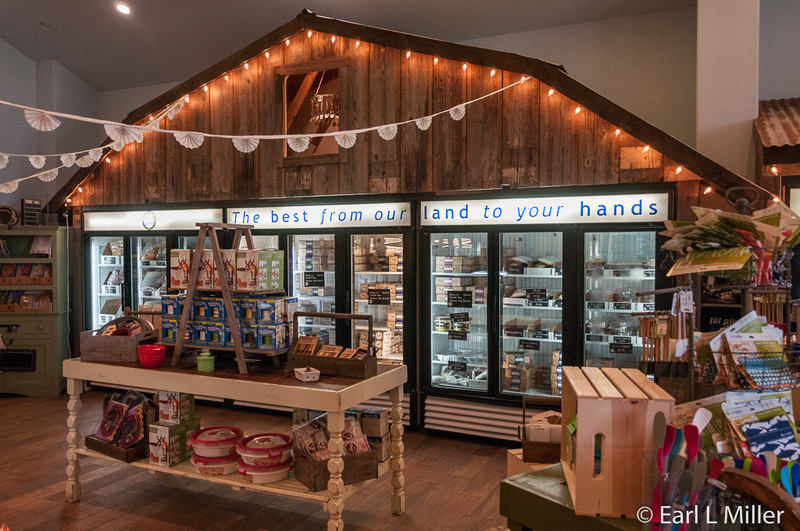 You can buy ice cream, scones, and muffins, pie slices, as well as smoothies and milkshakes. Outside is a stand with hot dogs, sausage sandwiches, and chips to eat at one of the picnic tables on the grounds while the kids play on the tractor or on the playground. 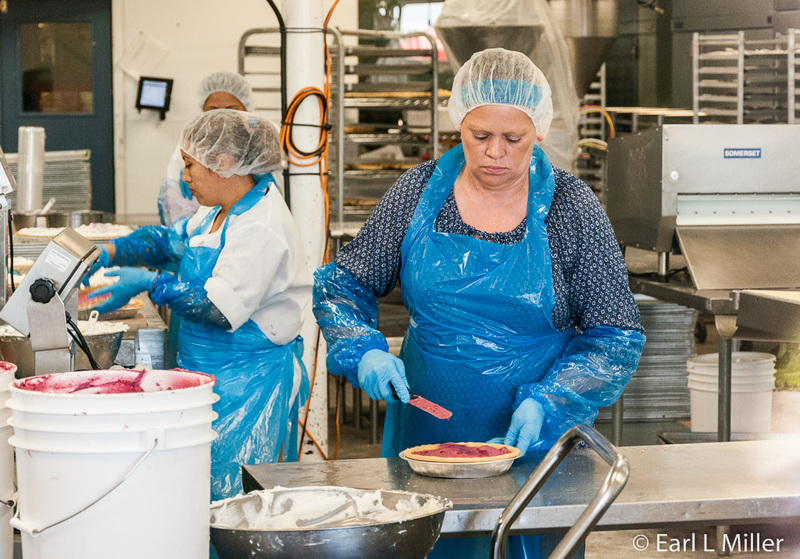 The pies are sold in 11 states with the bulk of it in the Pacific Northwest from the Bay area up to Washington. They’re available in high end grocery stores. They’re usually shipped frozen and raw. The local, in store bakeries bake them onsite or sell them in the frozen food aisle. They can also be purchased online and have been shipped as far as the East coast.